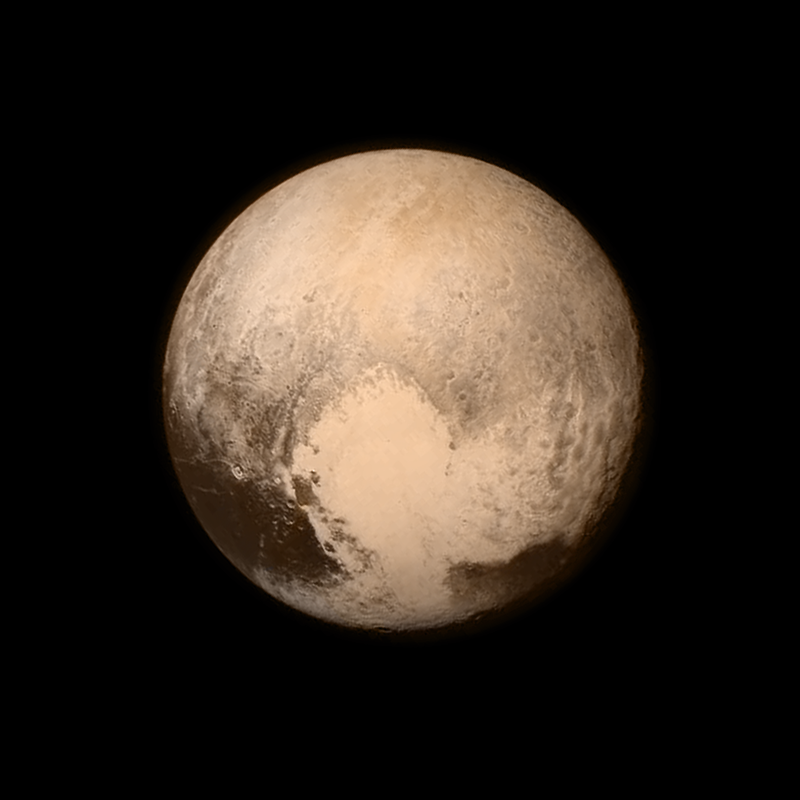 From an article posted on the New Horizons website on November 5, 2015. NASA’s New Horizons spacecraft has successfully completed record-setting maneuvers that have set it on course to reach 2014 MU69, which orbits in the Kuiper Belt, in January 2019. The four propulsive maneuvers were the most distant trajectory corrections ever performed by any spacecraft. The fourth and final maneuver started at approximately 1:15 p.m. EST on Wednesday, Nov. 4, and lasted just under 20 minutes. Data indicating that this final maneuver had been successful reached spacecraft operators at the Johns Hopkins University Applied Physics Laboratory (APL) in Laurel, Maryland, just before 7 p.m. EST on Wednesday. The maneuvers didn’t speed or slow the spacecraft, rather they “pushed” New Horizons sideways, giving it a 57 meter per second (128 mile per hour) nudge toward the KBO. 2014 MU69 is around 1 billion miles beyond Pluto, and the aim is for New Horizons to come within even closer range of MU69 than it did to Pluto on July 14, 2015. 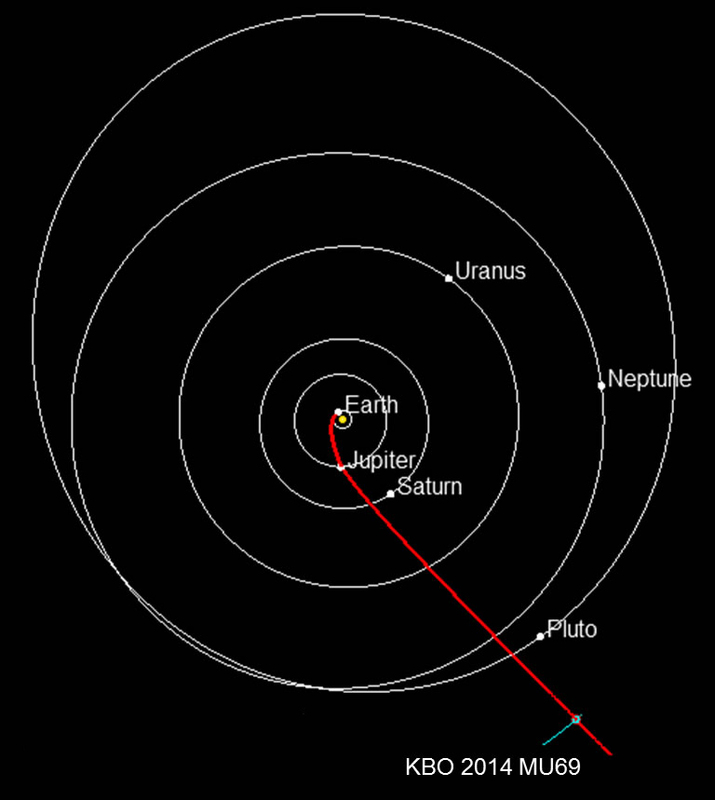 At the time of November 5th’s maneuver, New Horizons was approximately 84 million miles beyond Pluto and nearly 3.2 billion miles from Earth. The spacecraft is now 895 million miles from MU69, speeding at more than 32,000 miles per hour toward deeper space. For more information on Kuiper Belt objects, see Chapter 8.2 (p. 202-204) of The Cosmos. For the original article on the New Horizons website, click here. From a press release originally published on the John Hopkins Laboratory website on October 15, 2015. Following the first exploration of the Pluto system in history, NASA’s New Horizons team have published their first research paper detailing their findings of the distant planet. 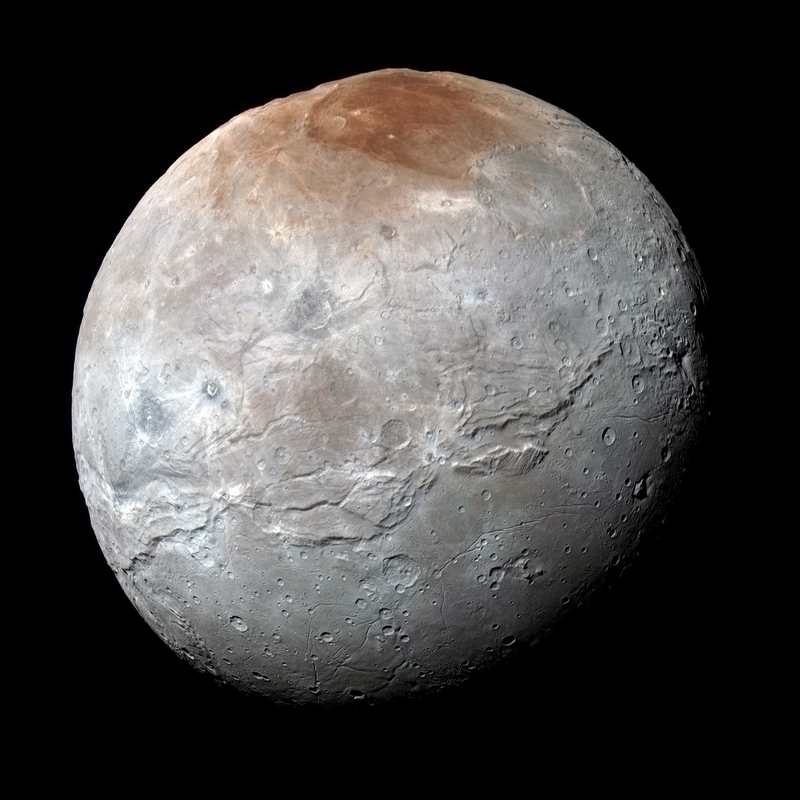 The paper, entitled “The Pluto System: Initial Results from its Exploration by New Horizons,” describes an unusual heart-shaped region, intriguing moons, and a surprising degree of diversity and complexity in the Pluto System. 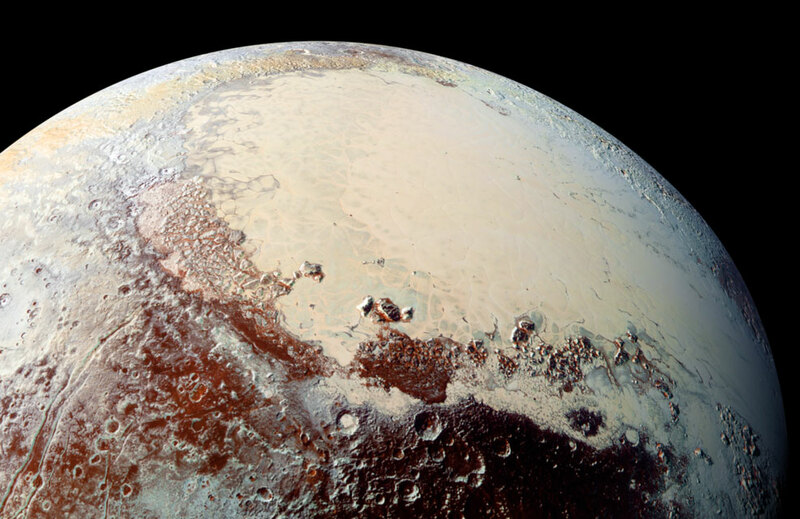 Team members believe that some of the processes on Pluto have occurred relatively recently, including those which involve the water-ice rich crust that they have discovered. This raises fundamental questions about how small planets remain active billions of years after their formation. NASA’s New Horizons spacecraft made it to within 7,750 miles of Pluto’s surface at its point of closest approach, gathering so much data that scientists won’t see the extent of it for another year. For more information on what we know so far about the dwarf planet right on the fringes of our Solar system, see Chapter 8.1 of The Cosmos. Link: for the original press release, click here. Fresh from its Pluto flyby in July 2015, NASA’s New Horizons spacecraft has a new mission. The next destination for the probe is to be a much smaller ice ball in the outer Solar System, almost a billion miles beyond Pluto. 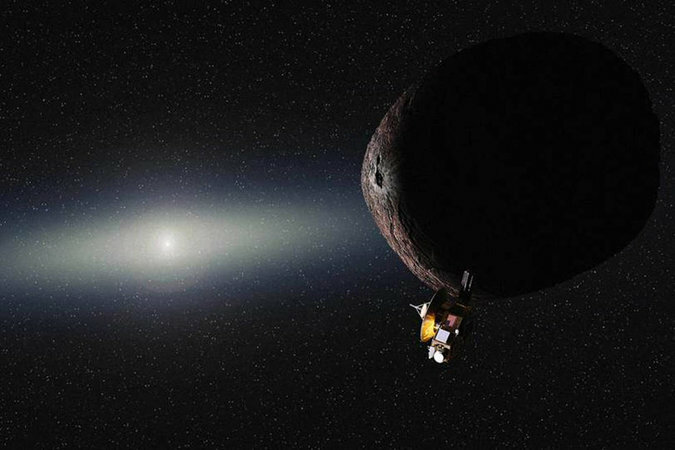 If NASA approves the extension to the mission, the spacecraft will visit the icy body known as 2014 MU69 in 2019 to capture photographs and data, in a similar way as for the examination of Pluto. While the vistas of this object would not be as impressive as those of Pluto, it would provide a close-up look at another piece of debris beyond Neptune, part of what is known as the Kuiper belt (see Section 8.2, pp. 202-204 in The Cosmos). NASA has already examined smaller icy objects like comets, some of which originate in the Kuiper belt, but the flyby of 2014 MU69 will “connect the dots”, says S. Alan Stern, New Horizons’ principal investigator. As an intermediate-size Kuiper belt object, the gap in our knowledge between smaller icy objects and the far greater Pluto will aim to be filled. For more information on spacecrafts flying by comets, see Section 8.3f, pp. 210-214 in The Cosmos.